Reserve Our Happy Place Today! this is a very nice cabin in a good location. We have stayed here a couple times and it is my favorite!! We absolutely enjoyed our stay! The cabin was the perfect size for my husband and I. Everything was very clean and in perfect working conditions. We will definitely book again in the future! My husband and I stayed in this cabin for our 10 year anniversary, and it was perfect! We loved the hot tub and the pool table and games. We didn’t feel we needed to leave much because we had plenty of entertainment right here. I highly recommend this cabin! This property has been our favorite Cabin!! It was the cleanest cabin we have stayed in. The only downfall to the cabin is the driveway is small, BUT that would never keep us from getting this cabin again. Beautifully decorated and had everything and more than needed. GREAT LOCATION!! Perfect location!! Thank you for leaving a review, Jessica! We wanted to let you know that the mattresses in this cabin are brand new, less than a year old. We are glad that you love the cabin and would rent it again. We look forward to having you stay with us again in the future and thank you for choosing Cabins USA! Our Happy Place was awesome I really enjoyed my time there, however I will say the walkway into the cabin is very dark at night. The solar lamps to light the path did not work. I would suggest replacing them because that is a steep hill. Or maybe even a street lamp. Also the shower door and all around had black build-up from over the years of use I assume. I would suggest a deep cleaning. But other than. Those two things my stay was great! Very beautiful and comfortable cabin. We loved our stay in this lovely cabin. Overall the property was nice however the cabin did have cobwebs in different rooms. The location is absolutely perfect--very private but still close to everything! The cabin was a perfect escape for my wife and I during our vacation. My only complaint was a lack of counter space in the kitchen. If you don't plan on doing a lot of cooking, it's not an issue. I can't wait to come back! This was a great place to stay. Enjoyed all the amenities they had to offer. Will be back soon. Thanks again. Everything was wonderful about this cabin! It was just like the pictures and perfect for a litttle get away with a friend, boyfriend, husband, or spouse. It is the perfect location. It’s close by everything, but still secluded. It even has a fully stocked kitchen. Our blender wasn’t broken so that was the only downfall because we could make frozen drinks. But overall, I LOVED it! The location is great! The cabin is nice and cozy. We hope to come back when it's a little warmer so we can take advantage of the grill on the back porch. We loved it! Loved it!!! Will be back with our kids very soon!!! My newlywed wife and I had a blast at our cabin. It had one of the biggest, comfiest beds either of us had ever laid in. There were only 2 issues we had with the place. One was the heating system wouldn’t heat the entire cabin, just the bedroom. The living room and kitchen were always ice cold. The second issue we had was hearing rats run across the ceiling as we tried to sleep. My husband and I had the time of our life,the cabin was fantastic,cozy and just what we wanted,it was close to everything,We had our wedding vows renewed at the cabin and it was wonderful we will surely be back. The cabin was astonishing. Everything about this cabin was perfect. We would love to stay in this cabin again next year. We absolutely loved this cabin. One of our “biggies” while vacationing is a comfortable bed & this cabin has that! Such a cozy place & we’re already planning to book for next year! We really enjoyed our stay! Perfect location! Very convenient to shopping ! The stay was wonderful, we were suppose to check in at 4 and did not arrive until 8:30 that night, loved how Cabins USA was open later to accommodate us. The cabin was in a great location not far from shopping and places to eat, only complaint was that there were some cob webs around the porch area in front and back deck that needed to go and the chair in the bedroom needed to be swept under. We loved the view and the hot tub on the back deck. We will definitely be staying here again next year!!!! Thank you for all of your kind words! We here at Cabins USA strive to give each guest the best stay possible while vacationing in the Smokies. When you are ready to stay with us again, please mention you are a return guest for an additional discount. Thank you for choosing Cabins USA and we look forward to seeing you again soon! Great Cabin! We were very happy with how clean it was and the kitchen was very well equipped. Kids loved the game rooom! I am so happy to hear that everyone enjoyed their stay in Our Happy Place! We here at Cabins USA strive to give each of our guests the best stay possible while vacationing in the Smokies. When you are ready to stay with us again, please mention you are a return guest for an additional discount. Thank you for choosing Cabins USA and we look forward to having you as our guest again soon! Had a great time. The cabin was very nice. Everything was neat and clean. This was our 3rd time booking with Cabins USA and will dontinue, however, we were deeply disappointed in this cabin. The bed was absolutely horrible. It is so sunken down on each side of the bed and the middle is actually raised its terrible!! We were miserable all week with sore backs due to the bed. Also, the hot tub wouldnt heat up. That was quite disappointing!!! The reviews we read when we booked back in January were all good but since returning I read the ones from people who were in this cabin the last couple months to weeks eight before us and several commented on the bed and hot tub. Its disappointing that those items have still not fixed. This was our 30th anniversary trip and even though the rest of cabin was nice and pretty clean it was disappointing to us and a little upsetting as we paid alot of money to stay in a cabin we booked because it had 5 stars back in January. I would not give it five stars now. I will still use Cabins USA but will not be booking this cabin again. I hope the bes and hot tub will get taken care of right away so others dont experience the disppointment we did. Thanks for making our stay a restful and awesome one. We will return next year. I am so happy to hear that you enjoyed your stay in Our Happy Place. When you are ready to stay with us again, please mention you are a return guest for an additional discount. Thank you for choosing Cabins USA and we look forward to having you as our guest again. We have rented about 2 dozen different cabins over the 13 years we've been visiting Pigeon Forge multiple times per year. This cabin was absolutely the cleanest, neatest we've encountered upon arrival. The proximity to the restaurants and shops is great, while retaining the "country" feel at the location and surroundings of the cabin. Kim and I found the furnishings to be comfortable and all were in very good condition. The attention to detail in finishing the woodworking of this cabin is certainly like none we've seen before. I Highly recommend this cabin and Cabins USA. We had only one question - we wanted assurance that using the fire pit outside was permissible this time of year. The staff member with who I spoke quickly determined that we were OK to roast marshmallows to our hearts content. Yes, this cabin was indeed Our Happy Place during our all-too-short stay there. I am so happy to hear that you enjoyed your stay in Our Happy Place! We here at Cabins USA strive to give each of our guests the best stay possible while vacationing in the Smokies. When you are ready to stay with us again, please mention you are a return guest for an additional discount. Thank you for choosing Cabins USA and we look forward to having you as our guest again! We used Express Check-in for the fist time we arrived at the cabin at 4:10 and it still being cleaned. The bed was too soft for our taste. It was the nicest decorated and stocked kitchen of any cabin we have stayed in. We love Cabins USA and will be coming back for Thanksgiving week. Thank you for taking the time to let us know about your recent stay in Our Happy Place! We here at Cabins USA work hard to ensure each of our guests have the same great experience you enjoyed while visiting the Smokies. When you are ready to stay with us again, please mention you are a return guest for an additional discount. Thank you for choosing Cabins USA and we look forward to having you as our guest again! We had an amazing time and will definitely recommend Our Happy Place to family and friends!! I am so happy to hear that you enjoyed your stay in Our Happy Place! We here at Cabins USA work hard to make sure each of our guests have the same great stay you enjoyed while vacationing in the Smokies. When you are ready to stay with us again, please mention you are a return guest for an additional discount. Thank you for choosing Cabins USA and we look forward to having you as our guest again! My experience was at Our Happy Place was wonderful!!! NO issues whatsoever. The location was great! Close to all the fun events and restaurants. I had a blast. All I will suggest is more lighting for nighttime, other than that, it was great. I am so happy to hear you enjoyed your stay in Our Happy Place! When you are ready to stay with us again, please mention you are a return guest for an additional discount. Thank you for your review and thank you for choosing Cabins USA! They need to do a good cleaning - the cabin had some trash in it that I had to pickup and it was dusty and needed scrubbing - shower was real dirty - I didn't expect to pay for cleaning and have to clean myself. The location was great, if they would have spent a little longer on the floors (installing the wood floor) in the place it would be considered beautiful... not cutting the floor long enough with slots open really may it look a little trashy and low end. I apologize for the issues you experienced with the hot tub. Your comments have been forwarded to our maintenance department to be addressed. Thank you for choosing Cabins USA and we look forward to seeing you again soon! Our Happy Place was just that, Our Happy Place. The cabin was located close to everything, yet private. The amenities supplied all your home away from home needs. We had a couple issues, but someone was out in no time. However, before we left the hot tub was luke warm again. We will definitely rent this cabin again. I am so happy to hear that you enjoyed your stay in Our Happy Place! We here at Cabins USA work hard to make sure each of our guests have the same great stay you enjoyed while vacationing in the Smokies. When you are ready to stay with us again, please mention you are a return guest for an additional discount. Thank you again for your review and thank you for choosing Cabins USA! It was beautiful, great location and very clean. Great little cabin located just close enough to everything but far away enough for privacy!! Loved the game room upstairs and the netflix which was a suprize. Everything was great from the easy check in to the awesome cabin!! Thank you for all of your kind words! We here at Cabins USA work hard to make sure each of our guests have the best stay possible while vacationing in the Smokies. When you are ready to stay with us again, please mention you are a return guest for an additional discount. Thank you for choosing Cabins USA and we look forward to seeing you again soon! Our second time of staying at our happy place and will definitely be back. It is close to all the attractions but scheduled enough to enjoy your privacy. The cabin is very nice decorated and has everything you need. We was happy to see the deal on your website for the month. Very nice cabin close to town. Enjoyed our stay very much. Parking is somewhat challenging and king size bed really needs a new mattress. Thank you for taking the time to let us know about your recent stay in Our Happy Place! We here at Cabins USA work hard to make sure each of our guests have the same great stay you enjoyed while vacationing in the Smokies. Thank you for letting us know about the king bed. Your comments have been forwarded to our Owner Liaisons and they will be bringing this to the owner's attention. When you are ready to stay with us again, please mention you are a return guest for an additional discount. Thank you for choosing Cabins USA and we look forward to having you as our guest again! Great experience. Would definitely rent again. Only negative is, I wish the bathroom had a mirror over the sink. Looks like a mirror use to be there, but hadn't been replaced by our stay. Thank you for taking the time to let us know about your recent stay in Our Happy Place! We here at Cabins USA work hard to make sure each of our guests have the same great stay you enjoyed while vacationing in the Smokies. Thank you for letting us know about lack of mirror in the bathroom. That has been forwarded to our Owner Liaisons who will bring this to the owner's attention. When you are ready to stay with us again, please mention you are a return guest for an additional discount. Thank you again for your review and thank you for choosing Cabins USA! We enjoyed our stay at this cabin. Everything was clean and it was in a very convenient location. We were able to enjoy the hot tub while we grilled our food! The only complaint is that the sofa bed was stained but we had a blow up mattress with us and used it instead. Also the jacuzzi drained very slowly but upon leaving , I let the office know and they were polite about it and said they would send someone to snake it. I would recommend this cabin. It was myself, my husband and a 4 yr. old. It was very comfortable for us. Thank you for taking the time to let us know about your recent stay in Our Happy Place! We here at Cabins USA work hard to make sure each of our guests have the best stay possible while vacationing in the Smokies. Our maintenance department has been notified of the mattress and Jacuzzi and are addressing those. When you are ready to stay with us again, please mention you are a return guest for an additional discount. Thank you again for your review and thank you for choosing Cabins USA! The cabin was in a grey location. It was the perfect size for the two of us, however, the mattress was broken down and very uncomfortable. Super cute cabin. Was very pleased with this cabin. 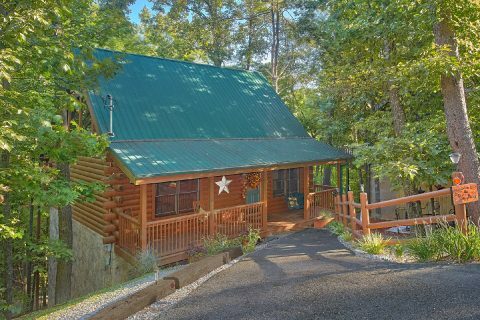 This cabin is located just a few minutes from Pigeon forge but far enough away to be quite and peaceful. The only thing I would change is the sidewalk to the cabin. It is a bit steep so would not suggest to anyone with bad knees or hip. But I would definitely rent this cabin again perfect for a family of four. The cabin was beautiful! Most of all, it was clean. I could not have asked for better service. I would highly recommend the cabin and Cabins USA.